Canadians rarely want to consider amputation as the best solution to treat a condition, but for Canadians living with diabetes, this can be a reality. In some cases, even severe ones, the amputation can be prevented, shielding the patient from a long and painful recovery period. 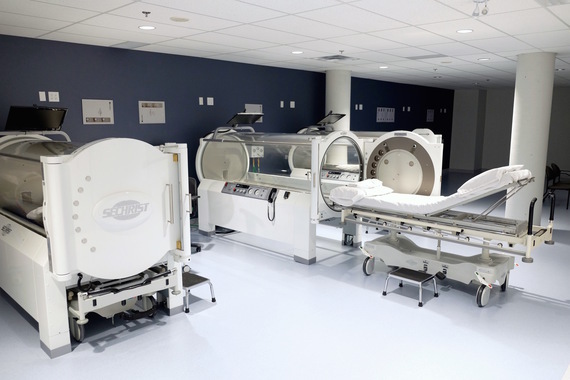 Hyperbaric Oxygen Therapy (HBOT) chamber tank used for specialised medical treatment for injuries in hospital clinic. To amputate or not to amputate? Some decisions are easier than others. Canadians rarely want to consider amputation as the best solution to treat a condition, but for Canadians living with diabetes, this can be a reality. Of the 2.3 million Canadians living with diabetes, it is estimated that 15 per cent will develop a diabetic foot ulcer in their lifetime, which can lead to amputation. Not only are diabetic foot ulcers accompanied by a long and painful recovery period, the Canadian Association of Wound Care estimates they cost our health-care system over $150 million annually. In some cases, even severe ones, the amputation can be prevented, shielding the patient from a long and painful recovery period. Karen Trace was managing a severe foot wound at the time she was diagnosed with diabetes. "The wound refused to heal and my doctor believed my only option was to amputate. Understandably, I was scared," she said. Though anxious, Karen's family was determined to find a solution other than amputation. After extensive research into possible alternatives, Karen's daughter discovered hyperbaric oxygen therapy (HBOT) at a medical centre in Scarborough, Ontario. "My doctor was aware of the treatment but cautious about how it would work for me. After consultations and several treatments, the wound completely healed and my foot was saved!" • Healing of wounds, such as the one Karen was managing. There is a need for HBOT and doctors are working to increase awareness of its benefits amongst health-care professionals and patients. Patients across Canada may be the right fit for HBOT treatments, but it's important for you to do your homework first! Once you have found the nearest HBOT treatment facility to you, speak with your doctor to see if you're an appropriate candidate. All patients referred to a hyperbaric medical centre or those who self-refer should undergo an initial consultation by a hyperbaric physician to determine if they are a fit. No need to fear! The consultation consists of an assessment for an appropriate indication for hyperbaric treatment. A thorough medical history, physical examination and review of results of tests and imaging (if needed) will be performed to determine eligibility before you start. Eligible patients for HBOT will have a treatment plan tailored to their needs, including the length of each treatment session and number of treatments. A typical treatment session lasts approximately two hours, while the number of treatments ranges from 20 to 60 in total. Before and after each treatment session, your condition should be assessed to monitor the progress. Hyperbaric chambers let you rest in a reclined or angled position. This means you can watch movies, listen to music or just relax during the treatment. Just breathe in and let the oxygen do the work. Oxygen really is more than just a breath of fresh air.